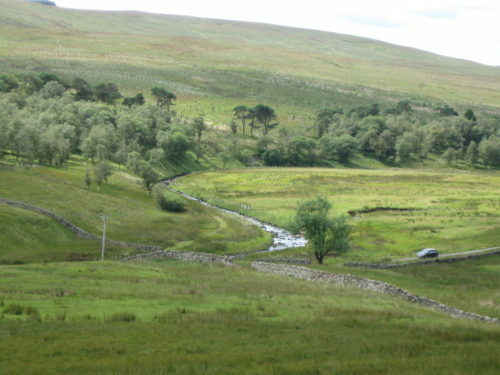 The River Wharfe begins high on the Pennines in a peaty bog known as Cam Fell. From here many springs arise, forming streams. The faint lines show where streams are flowing down the slope. These form Oughtershaw Beck. This flows on, through a deepening valley, to Beckermonds, an isolated hamlet (that’s a place that is too small to be considered a village). Here Oughtershaw Beck joins with Green Field Beck. The combined river becomes the River Wharfe. Well ok it depends on how much water there is to start with; how much rain there has been. It may not all disappear but some of it certainly does as there is less water flowing along the next stretch. It had rained a lot when I was there but this is what can happen. 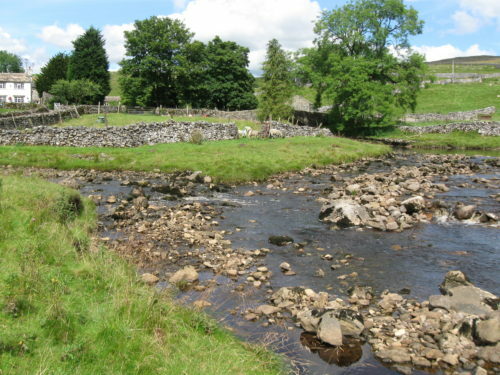 At Beckermonds, the River Wharfe flows over limestone rock. Limestone has lots of cracks in it and some of the water disappears down these. 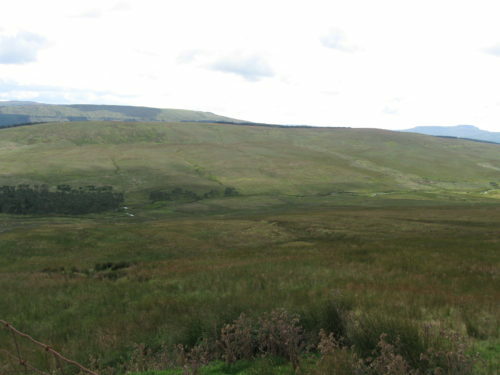 If the weather has been dry, and the river flow is already low, then the whole River Wharfe can disappear underground. It usually re-emerges about 3km downstream near Yockenthwaite. ‘Wharfe’ is a Celtic word meaning twisting or winding and the River Wharfe certainly does plenty of that. Next week we will take a look at some of the Wharfe’s twisting meanders and discover features that you can look out for on any river. Meanwhile sign up for the Blog About Britain newsletter and choose ‘Geography worksheets and ideas for further study’ to get a map of the places mentioned in today’s blog. Loving your posts, Sandra! Thank you so much for sharing your knowledge for free! Thank you, Rachel. I’m really enjoying writing and preparing them too.